platoon leader gathers his squad leaders to plan their next move during clearing operations to drive insurgents out of Baqubah June 20, 2007. FORT LEWIS, Wash. - ground-breaking approach to training has arisen from interviews with 5th Battalion, 20th Infantry Regiment Soldiers about their three months of fierce combat from March to June 2007 in Diyala Province, Iraq. The Fort Lewis Battle Command Training Center introduced a feature on its Web page last week that allows units to take virtual staff rides, translating Syke's Regulars' neighborhood-by-neighborhood fight to oust al-Qaida from Baqubah into leadership-development training. Since armies have clashed, military leaders have studied battles - how commanders in the field solved the tactical challenges arising from the fog of combat. Trying to understand why battlefield decisions were made, evaluating them and conjecturing what else might have been done at critical points, ultimately led to one of the Army's most effective teaching devices - the staff ride program. Oral histories have given way to formal, detailed studies overseen by the Combat Studies Institute of Command and General Staff College at Fort Leavenworth, Kan. The Army has published handbooks for major and minor conflicts from Cowpens to Chickamauga that form the basis for staff rides on each. But the Fort Lewis BCTC has taken them to another level with "virtual" staff rides. This new initiative grew out of the BCTC's ongoing "PRIDE process" that gathers observations, insights, and lessons from Soldiers returning from combat for use in Fort Lewis training and leader development. PRIDE stands for pre- and post-rotation interviews and data-capture events. It includes SLA Marshall individual video interviews, peer-group interviews, computer data entry, topically focused, process-capture interviews, major event investigation and documentary battle-account production. Doctor William Reeder, chief of leader development, and his staff at the BCTC, along with BCTC staff members Bill Koziar and Jim Clegg, have been assembling multimedia accounts of key conflicts on DVD. The BCTC leadership team wove together maps, interviews and animation to produce decision-making exercises, accounts of battles, and now, virtual staff rides that incorporate time-sequenced situational vignettes. An earlier decision-making exercise proved the utility of using tactical vignettes based on real combat experience. The program arose from an incident involving Soldiers from the 172nd Infantry Brigade called 100th House. The scenario detailed small-unit actions upon detonating a massively wired house in Mosul, one of the first house-borne improvised explosive devices of the war. The decision-making exercise stopped at key decision points to allow discussion of leaders' actions. Next, the BCTC staff completed the documentary battle account based on their interviews of 5-20 Inf. 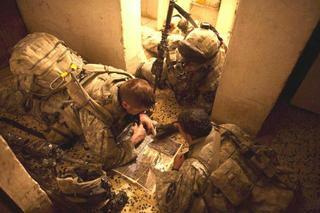 Soldiers about their marathon struggle to take back al-Qaida's self-proclaimed capital of Baqubah. The next step was to turn the Baqubah campaign into a virtual staff ride, now available on the BCTC Leader Development pages off StrykerNet. Army Knowledge Online subscribers can access the page at https://strykernet.army.mil/sites/leader/default.aspx. Click on the "Virtual Staff Ride" tab along the left side and follow prompts from there. Reeder said the virtual version mirrors the structure of the traditional staff rides of Army doctrine. There are three phases: the preliminary study phase, the field study phase and an integration phase. The virtual ride encompasses all three, guiding units through preliminary reading and post-field-study discussions of the integration phase. "In the preliminary study phase ... you go to a page with all your reading assignments," Reeder said. "First they'll be asked to review (a) pamphlet so they understand the staff ride as dictated by Army doctrine, what they'll be expected to do. Right now they have four reading assignments and then they will watch the Baqubah DVD. That's their preliminary study phase." Once the preliminary reading is complete, participants review the VSR substitute for the field component. The virtual field study phase for Baqubah is divided into several parts or "stands" with a tab for each. Those who start at the beginning follow events at each stand with a geographic orientation, situation update and an eight-to-20-minute tactical video vignette. "The video fades into a series of discussion questions that let the participant respond," Reeder said. "What are the key learning points of this vignette' What are the principal elements of Army doctrine that are utilized here' The decison-making processes' The best application of tactics, techniques and procedures' What things are there to read, consider and discuss' Click and a school solution pops up from the BCTC Leadership staff." As a veteran of conducting Gettysburg and Little Big Horn staff rides among others during his active-duty career, the leadership chief has put the sum of his experience into the project. But the retired colonel said his staff's hard work as well as that by other BCTC elements, produced the product that he hopes will be used Armywide. Key to the development of this new and innovative leadership training capability, Reeder said, was the Web design and video editing savvy applied by the BCTC training support team, led by George Tatarinow along with Matt Latimer and Brent Barber. "We're real proud of it," Reeder said. "It has never been done anywhere in the Army; nowhere on the face of the Earth has anyone attempted a virtual staff ride in this sense."